I've come down with a nasty little summer cold so dinner last night was in Matt's capable hands. He had come up with the idea for this pizza so it made perfect sense for him to make it anyway. He was looking for a good use for the beets & arugula we had gotten in our CSA box. 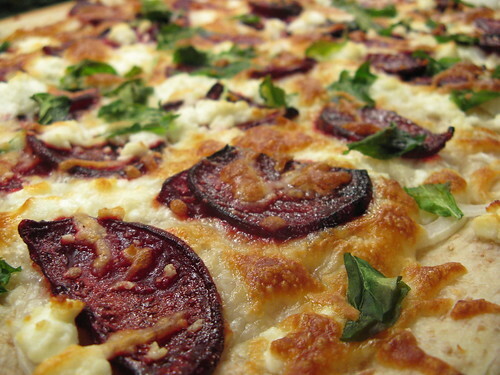 We knew the flavors of beet & goat cheese were good in a tart so why not on a pizza. It was very good, well at least from what I could tell with my nose stuffed up. The sweetness of the roasted beets goes so well with the tartness of the goat cheese. The only change we would make to this dish is the next time we'll roast the onion with the beets to caramelize it & at the same time roast some garlic & add a little thyme. We did a little twist on our favorite pizza dough & added some wheat bran to it, just to make it a little healthier. It really made a nice addition to the crust's texture. We've been noticing lately that the pizza dough we use seems to require more flour than the original recipe calls for, especially when we are halving it to make only one pizza, so this revised version accounts for that. In a mixing bowl combine the warm water, yeast & olive oil. Stir to combine. Mix in the wheat bran & salt & stir. Add the 1 1/2 c of flour a half cup at a time stirring with each addition. Once you can't stir the dough anymore begin kneading it. It it is sticky add more flour about a tablespoon at a time. Knead until you have a smooth dough. Coat the inside of the bowl with a little olive oil. Turn the dough in it to cover all sides. Cover the bowl with a dishtowel & allow the dough to rise for about 2 hours or until doubled in size. The dough is now ready to use. Preheat oven to 400 F. Place the beets in a baking pan & drizzle with the olive oil, stir to coat. Sprinkle with salt. Roast the beets for 20 - 25 minutes until soft & browning. Set aside. Turn the oven up to 450 F. Grease a baking sheet with little olive oil. Spread the pizza dough out to the desired size & thickness with oiled hands. Sprinkle the pizza with the mozzarella. Top with beets, onions & arugula. Crumble goat cheese over the top. Bake for 15 minutes or until the cheese is bubbly & brown & the bottom of the crust is browned. Never had beetroot on a pizze before. The colours are fantastic and Im certain it tastes as good as it looks!! I hope you're feeling better! Don't you hate it when you know something is probably sooo good, but you can't taste it very well because you are so sick?? What an interesting pizza. It sounds delicious and it's so pretty! 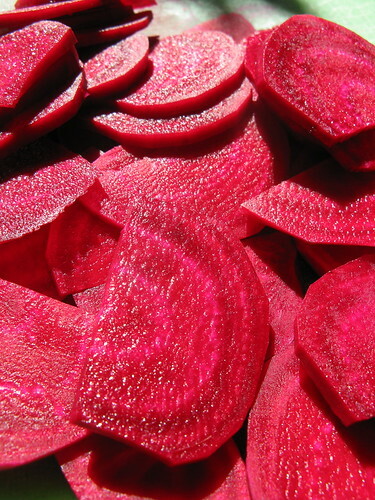 I would think that even roasted beets would run and "stain" things pink, no? We (my wife and I) love arugula on pizza. We first had it in Italy, where they don't cook the greesn, just top the pizza with it like salad. We like it cooked too though. I don't like beets. As a matter of fact, I hate them. But if you fed this to me, I'd totally eat it. I know it would taste good. how cool! it's like your typical beet/goatcheese salad turned into pizza!! I'd add some pine nuts. mmm i love beets! candied, roasted, sauteed, baked, any way you serve them, i love them! this looks delicious.. i always love a good CSA box! Beets seem to be appear on everyone's blogs these days... this looks delicious. I love beets and goat cheese together in salads so it only makes sense that I'd love them even more on pizza! This is a gooood recipe! I used it in my very first post of my nascent blog. Just wanted to let you know. Thanks! Made this tonight and it was delicious. Crust was one of the best I've ever made -- despite the fact that I idiotically used wheat germ instead of wheat bran. Turns out wheat germ in pizza crust is perfect! Thanks for the recipe. Delicious! Made for 3 beet lovers and 1 beet hater. All loved it and the beet hater had 3 slices. Thanks! That looks mighty delicious. Also, not too hard to make, either. Did you not use any sauce as a base on the crust? Oil the crust maybe a tad? Sounds like it might be a bit dry. No sauce on this pizza. We may have brushed some olive on before adding the toppings. The cheese keeps it from being too dry. I prefer my pizza topping not very saucy.